I love the emotion you captured in this photo. You get it right every single time. AMAZING WORK!!! So cute! Nice vignette, you are so good at finding those. love this! the colors are fantastic and so is the expression! Anna, I love your work. Are you really moving? I keep thinking there must be some way for me to meet you/pick your brain since you're in Utah. If I beg, plead, grovel on my knees and bring you your favorite treats? Angie, you look fabulous. And your twins are adorable. This is wonderful. Very natural, and sweet. 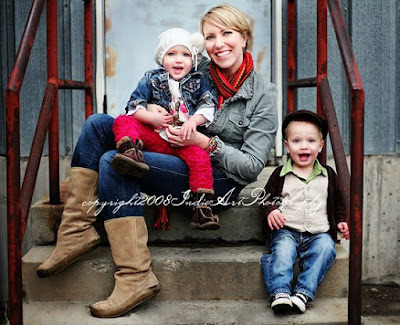 I seriously adore this picture of my kids and I. I am thinking canvas! I love how you set this one up. Perfect! I love all the colors too! SOOO Adorable! I'm jealous; I think it's every mother's dream to have a beautiful pic of her with her babies! Great job on these as always! Angie is one of my favorite people! You captured them beautifully! Your work-as always...is AMAZING!!!! LOVE this picture. I think I'll have you take a few of me and my kids this year! P.S. Where does one find your pricing/session information? I love your work as well!